Last week details emerged the Huawei Watch GT, and new smartwatch from the tech giant which is expected to take on the Samsung Galaxy Watch and Wear OS devices. Now we have some more details on the watch, including its operating system, battery life, and a higher resolution image. First, let's take a look at that new image (below). It shows off a handsome black watch case with two chronograph style pushers at 2 o'clock and 4 o'clock. The case is reportedly made from black ceramic and stainless steel, and has been described at “ultra-thin”. Perhaps the most interesting new piece of information is that the Huawei Watch GT won't be running Wear OS like the Huawei Watch 2, instead it'll run a custom OS developed by Huawei. It's a risky move, but one that could pay off as Wear OS still lags behind compared to Samsung's Tizen and Apple's watchOS. The smartwatch is also said to have a seven day battery life with the Always On Display active. This is thanks to a efficient processor and large 420mAh battery. 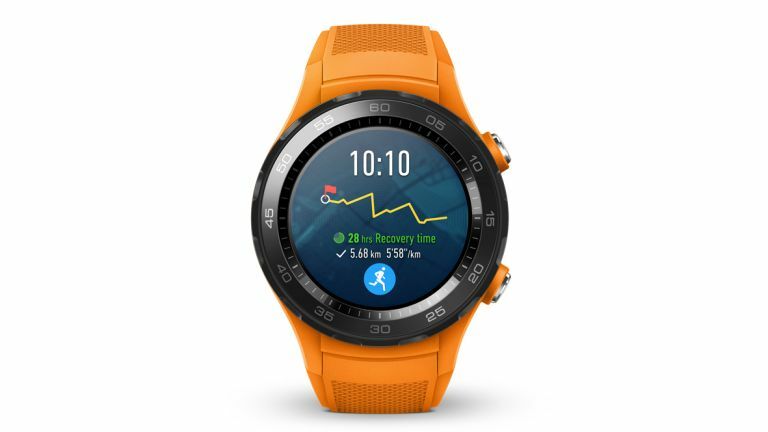 The Huawei WAtch GT will use a 1.39-inch OLED screen with 454 x 454px resolution, and of course have a heart rate sensor, GPS and motion sensors to track your exercises. Interestingly there could be an IR blaster in there as well. Are you intrigued? You should be, if Huawei can get the operating system right this could be an excellent device. The Huawei Watch GT is expected to launch in Europe alongside the Mate 20 and Mate 20 Pro in the coming weeks. It will cost around €200.